Insights in Analytical Electrochemistry is an international, peer-reviewed; Open Access journal that publishes research articles on all aspects of Analytical Electrochemistry. Analytical Electrochemistry is a scholarly open access journal provides free and unrestricted access to the published findings in the concerned domain. The removal of copyright barriers to the flow of scientific information under the norms of open access is aimed at informing and educating about the latest research in organic chemistry. Individual manuscripts submitted by authors are peer-reviewed by experts from related research area. 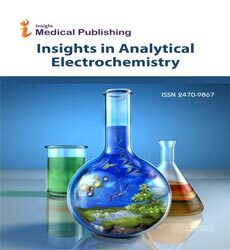 Insights in Analytical Electrochemistry Covers topics related to: Electrochemistry, Potentiometry, Voltammetry, Coulometry, Biosensors, Gas sensors, Sensor applications for food industry, medicine, pharmacy, environmental monitoring, corrosion, Analytical methods, modeling, readout and software, Electrochemical methods (amperometry, voltammetry, impedance spectroscopy, conductometry), CorrosionScience, Electrochemical Synthesis, Analytical Electrochemical Aspects, Electroanalysis, Applied electrochemistry, Electrochemical Aspects of Biology, Biological Aspects of Electrochemistry, Bioelectrochemistry, Applications of electrochemistry in medicine and biotechnology, Pharmaceutical and biomedical analysis, Application of Chemometrics, Methods in Electrochemistry, Theoretical and Computational Electrochemistry. Insights in Analytical Electrochemistry is an Indexed, peer-reviewed open access journal that aims to publish the most complete and reliable source of information on discoveries and current developments in the mode of original articles, review articles, case reports, short communications, etc. in the field and provide free access through online without any restrictions or any other subscriptions to researchers worldwide. Articles submitted by authors are evaluated by a group of peer review experts in the field and ensures that the published articles are of high quality, reflect solid scholarship in their fields, and that the information they contain is accurate and reliable. Insights in Analytical Electrochemistry uses Editorial Manager System for a qualitative and prompt review process. Editorial Manager is an online manuscript submission, review and tracking system. Review processing is performed by the editorial board members of Analytical & Electrochemical journal or relevant experts from other universities or institutes. Minimum two independent reviewer’s approval followed by editor approval is required for the acceptance of any citable manuscript. Authors may submit manuscripts and track their progress through the editorial system. Reviewers can download manuscripts and submit their opinions to the editor whereas the editors can manage the whole submission/review/revise/publish process via editorial manager. Bio sensor Journals deals with the biosensors including sensors. A Biosensor is associate degree analytical device, used for the detection of associate degree analyte, which mixes a biological element with a chemistry detector. The term 'Biosensor' is commonly accustomed cowl sensing element devices employed in order to see the concentration of drugs and different parameters of biological interest even wherever they are doing not employ a biological system directly. Conductometry Journals deals with the conductometry related topics including conductometry. Conductometry could be a mensuration of electrolytic physical phenomenon to observe a progress of chemical change. Conductometry has notable application in analytical chemistry, wherever conductometric volumetric analysis could be a commonplace technique. In usual analytical chemistry observe, the term conductometry is employed as a equivalent word of conductometric volumetric analysis, whereas the term conductimetry is employed to explain non-titrative applications. Insights in Analytical Electrochemistry, Organic Chemistry: Current Research, Chemical Sciences Journal, Journal of Theoretical and Computational Science, Conductometric Analysis, Conductometry and Thermodynamics, Sensors, Journal of the Brazilian Chemical Society. Corrosion Journals deals with the physics related topics including corrosion. Corrosion may be a activity, that converts refined metal to their a lot of stable compound. it's the gradual destruction of materials (usually metals) by chemical action with their atmosphere. Coulometry Journals deals with the coulometry related topics including coulmetry. Coulometry is that the name given to a bunch of techniques in associate an analytical chemistry that make sure the amount of matter reworked throughout an electrolysis reaction by measurement the amount of electricity (in coulombs) consumed or created. Electrochemical synthesis Journals deals with the chemistry includes the eletrochemistry. Eletrochemistry Synthesis in chemistry is that the synthesis of chemical compounds in Associate in electrochemical cell. The most advantage of electro synthesis over a normal chemical reaction is rejection of the potential wasteful alternative half-reaction and therefore the ability to exactly tune the desired potential. Electro synthesis is actively studied as a science and conjointly has several industrial applications. Impedance spectroscopy Journals deals with the Impedance spectroscopy related topics including impedance spectroscopy. Impedance Spectroscopy analysis (IS) has become a serious tool for work the properties and quality of dye-sensitized solar cell (DSC) devices. Insights in Analytical Electrochemistry, Biochemistry & Analytical Biochemistry, Journal of Physical Chemistry & Biophysics, Organic Chemistry: Current Research, Impedance spectroscopy, Electrochemical Impedance Spectroscopy, Electrochemical Impedance. Potentiometry Journals deals with the potentiometry related topics including potentiometry. Potentiometry are often like direct meter analysis of a reaction. it's a helpful implies that of characterizing degree acid. No indicator is used; instead the potential is measured across the analyte, typically degree resolution. To do this, a combine of electrodes square measure used, degree indicator conductor (the glass conductor and metal particle indicator conductor) and a reference conductor. Reference electrodes sometimes used square measure half electrodes, chloride electrodes. Voltammetry Journals deals with the voltametry related topics including voltametry. voltametry could also be a category of electroanalytical methods utilized in analytical chemistry and varied industrial processes. In voltammetry, data relating to associate analyte is obtained by measuring the current as a result of the potential is varied.